Robert Pendergast holds music performance degrees from the University of North Texas, Florida State University, a post-graduate diploma from the Royal Northern College of Music, Manchester, England where he studied with euphoniumist Steven Mead. At the University of North Texas, Pendergast studied with Donald C. Little, Marc Dickman, Peggy Heinkel-Wolfe, Jan Kagarice and briefly with Brian Bowman. 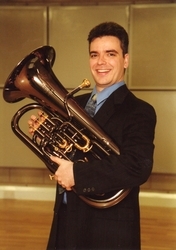 Pendergast took lessons with Paul Ebbers at the Florida State University (FSU), and was the second euphonium player to earn a Doctor of Music degree from the FSU College of Music. As an international performer, Pendergast has played in Monterrey, Mexico, England and Jönköping, Sweden. He has been a semifinalist or finalist for several international competitions and military band auditions, including the “Presidents Own” Marine Band, “The Pershings Own” Army Band and the West Point Academy Band. Pendergast taught low brass at the Bethune-Cookman College department of music from 2004 to 2006. He is currently adjunct instructor of trombone at Southern Adventist University in Collegedale, TN.